DFS - What Does It Mean? 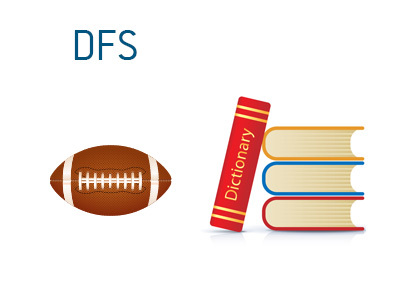 What does the term "DFS" mean as it applies to the world of fantasy sports? What is the definition of the term "DFS"? The term "DFS", when referring to the world of fantasy sports, stands for "Daily Fantasy Sports". In 2006, the UIGEA (Unlawful Internet Gambling Enforcement Act) effectively banned real money online gambling in the United States. There were however, several "carve-outs", including one for fantasy sports. At the time, nobody envisioned that the daily fantasy sports industry would grow out of the passing of this bill. With traditional fantasy leagues, players draft teams that will compete against each other on a daily basis. For instance, you and nine of your friends may hold an annual NFL fantasy league in which you each pick a roster of players. In most cases, these leagues will have an entry fee, with the top 2-3 finishers receiving some money for their troubles. The UIGEA carve-out for fantasy sports was meant to address these types of leagues and make them legal, as the NFL (and other leagues) depend tremendously on fantasy leagues for ratings. A number of years ago, the first "daily fantasy sports" site hit the market. Unlike traditional fantasy leagues, daily fantasy sports sites offered people the chance to pick new teams on a weekly or even daily basis. For instance, let's say that you decided to enter a NFL $100,000 guaranteed tournament on FanDuel in exchange for an entry fee of $5. This contest would run for a single week, usually covering the Sunday and Monday football games. At the conclusion of the last game, each team would have a cumulative number of points, based on the players that they selected for their teams. In the case of Fanduel, players have to select a QB, two RBs, two WRs, a TE, a Kicker and a Defense. In the case of the tournament listed above, the winner of the tournament might take home a sum of $25,000. Thanks to the UIGEA carve-out, DFS is legal in most states in the United States. There are, however, many people who feel as though the industry is treading a very fine line when it comes to its legality.